The build up leading to the premier of Tron Legacy that comes to theater in December continues. In Florida, we have seen the Light Cycle wraps on the monorail for months now. Tron has had a huge presence at the past two Comic Con conventions. 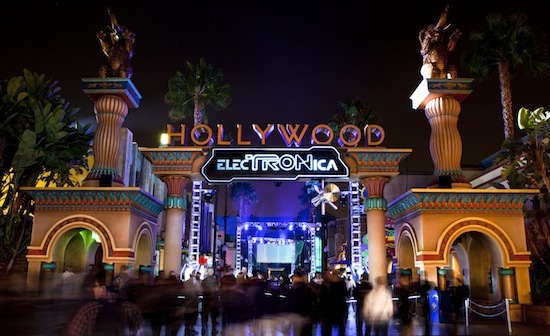 Out in Anaheim at Disney California Adventure, the new nighttime party entitled ElecTRONica debuted this weekend. The show will run on Fridays, Saturdays and Sundays. It is expected it will continue through the holiday season and into the spring. The party joins a nighttime lineup at Disneyland and Disney California Adventure that includes Fantasmic, Magical (fireworks) and World of Color. Guests can expect to be immersed in the world of Tron. It all starts with high-energy music, videos and dancing on stage at Sunshine Plaza in the early evening. As guests enter the back lot area of California Adventure, the facades of the buildings will be illuminated with images from the movie and light cycles zooming past. DJs will keep the music pumping while guests can show off their best moves on a dance floor. There will be street entertainers such as “Laserman” who does amazing tricks with lasers and light. 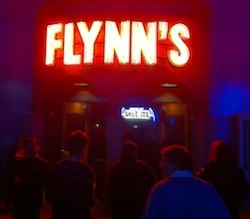 Near the dance floor sits Flynn’s Arcade where guests can play their favorite video games from the eighties. The arcade is an important location in the movie. The Muppet Vision 3D theater will feature a 3D extended preview of Tron: Legacy complete with exclusive special effects. Look for 10 minutes of lots of never before seen footage, including an entire scene from the film. The special preview will only play during the ElecTRONica party in the evening. In 1982, the original Tron movie captured my imagination. It was a movie about a guy who wrote programs for video games who got zapped into a computer. For a young boy, what was not to like? I am excited to finally be close to a sequel. Hopefully the new movie lives up to the hype both generated by Disney and fueled by my own pre-teen memories of the original. There is a robust website for everything Tron Legacy Here. • Andy Guinigundo is the author of the Out of The Loop column in “Orlando Attractions Magazine”. Out of the Loop keeps you up-to-date with attraction news outside of Central Florida. Andy lives in Cincinnati, Ohio with his wife and three daughters. He grew up frequenting theme parks around Ohio and making trips to Orlando with his family. While for most of the year, he’s out of the Orlando loop, he tries to visit Florida at least once a year.